David: Hi Kevin, thanks for allowing us to profile your business this month. The last profile we did was for a merchant selling samurai swords. Your project is a little less lethal, but definitely no less serious. Speaking as a totally cool uncle, but not as a parent (at least not yet), I can imagine why someone would want a baby monitor hooked up to their Smartphone. However, I've never actually felt that "stress" wondering what the baby is up to. I feel there might be a back story to how you got this idea. How did you come up with the idea for this product? Kevin: Hello David; thank you for having me. The idea for this product came when my wife and I were pregnant with our daughter and we were checking out all the cool new products that were available for babies. We had just become Smartphone users and assumed that there would be a perfect product out there that worked with them. We wanted a quality product that wasn't confined to hang on the wall in the nursery; something that didn't force us to use a bunch of mirrors to see what was going on in the rear-facing car seat. I couldn't find one so being a mechanical engineer, I started to design one at home; and that is when the Uberwatcher was born. David: I should share with our readers that this is a new product launch; something that hasn't been done before. Tell us more about the actual device and how it works. Kevin: Uberwatcher Technologies Inc. has developed a revolutionary new way for parents to monitor their children. You were right when you said earlier that we are leveraging the multi-purpose functionality of a Smartphone to improve upon an old fashioned way to do something. The Uberwatcher is a portable, audio, video, baby monitor that works with your Smartphone. It can be used in the nursery, throughout the home, in the car or wherever else you may need it. David: Did you build the product yourself? What did that involve? Kevin: I started the design of the Uberwatcher a little backwards; I assumed that the technologies and electronics I needed could be made to do all the things I wanted and I designed the housing for that they needed to fit into. Lucky for me, I teamed up with the right manufacturer. They thought I was a little nuts at first but they pulled it off and I now have a working prototype that looks and works awesome. It's everything I asked for and more. The Uberwatcher comes with night vision, an 8 hour rechargeable battery, colour video, audio, wall charger and a whole lot more. 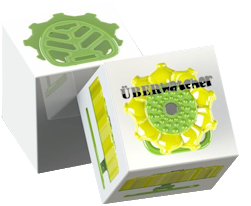 We are moving into production of the iPhone version of the Uberwatcher and will have product ready for shipping early 2013. David: I certainly imagine that creating an idea from scratch, researching it, having a tangible prototype engineered, built and manufactured, in conjunction with coding a Smartphone application and launching a brand is about one of the biggest challenges someone can throw at themselves. In fact, just typing that sentence overwhelmed me. I'm hoping that the building of your e-commerce website was the easy part. (Otherwise I'm not doing my job very well!). With that said, why did you choose Merchant Accounts.ca? Kevin: I knew early on that there was no way that I could do this completely by myself so I teamed up with the right people at the right time to keep the Uber-wagon rolling. To cover some of the tech questions, I contacted a former college of mine and he happened to know a web developer, jocool.com and a few other key characters. The website was up in no time and it looked great but I needed a simple, fast solution to make it capable of processing transactions and collecting customer payments. I still have a bad taste in my mouth from the first company I turned to. Their requirements were disorganized and never ending. When they were finally satisfied, they wanted still more time for their review board to approve everything. That was the last straw and with the hair on my neck still standing on end, I turned to Merchant Accounts.ca at the suggestion of my web developer. Your teams response time to get me fully up and running was exactly what I needed; fast and pleasant. David: I'm always glad to hear how awesome we are! Don't worry, I'm done patting myself on the back (for a moment). On the serious side, what was your experience like during the setup process? Kevin: I had a response to my first email within 24 hours which contained a complete list of everything I needed to provide. It was very organized, with more than enough information to explain what was needed and why. The steps that followed were a symphony of synchronous actions designed to produce the end result that best fit my solution needs. We were even provided boxed solutions for our website which made the payment integration attractive and effective. David: I actually can't take credit for most of that. There is a wonderful lady Jennifer who handles the paperwork here. What the heck though, I trained her so I am going to take credit for it. Thanks Kevin! Back to the interview... it sounds like it went pretty smoothly overall. Were there any challenges that you ran into during the setup process? Kevin: The setup was easy as pie. As a new, small company, e-commerce was not an area that we had a great deal of experience with. Merchant Accounts.ca walked us through the entire process, explaining things as we went. Kevin: We ended up using your EasyCheckout buttons to put up �Buy Now' buttons on the website. So, the Uberwatcher device is purchased right online though the e-commerce interface. On my side I was happy because your EasyCheckout buttons are free to use. Our web developer was the real winner though because he jumped at the opportunity to use an attractive prebuilt solution. It pretty much made it cut, paste, done. David: I'm glad that you found it helpful. I actually built that myself way back in the day, and have since handed it over to a developer we work with to polish it up and build in new features from time to time. I just liked the idea of a simple 1-click button you could stick up anywhere without having to configure a full shopping cart. (Albeit, it's certainly not meant to replace a full fledged cart). I am going to try to glean some advice that might be helpful to other small and mid-sized business owners launching their first online store. When you were in the research stages (before working with us), what were the biggest concerns you had before getting started implementing your payments solution? Kevin: Selling product online has many advantages over a store front but it comes with some necessary evils as well. We wanted a quality solution to my e-commerce needs and we didn't want to get dragged over the hot coals to get it. There is no question that if you want to play in the online sandbox that you need to play with the right people (and you need to play nice). To be successful online you need to get your name out there and you need a quality product; what you don't need is to be working with costly payment solutions that are time consuming to set up and are not reliable. Merchant Accounts.ca provided an elegant solution to us through their intelligent, in-house, friendly staff. It cleared a path for us so that we can focus on what really matters; and that's getting people saying "I have and an Uberwatcher, what do you have?" David: Like a lot of merchants, I think you �just needed something that worked'. I get that, and I am glad the solution has worked out for you. Any additional thoughts or comments? Kevin: There are times in business when, hurry up and wait isn't an option; I want to thank Merchant Accounts.ca for firing the engine in our Uber-machine. David: Thanks Kevin. And thanks for taking the time to chat. I think you provided some good insight that a lot of small business owners find themselves in along the way.